She's Doing Her Bit to Reduce Plastic Menace #WATWB - A Rose Is A Rose Is A Rose! Single-use plastic products are a big environmental hazard with a number of Indian states finally putting curbs on their use. While we may or may not have taken to using plastic alternatives in our everyday life, there is one person who is making efforts to limit the use of plastic in a small but significant way. 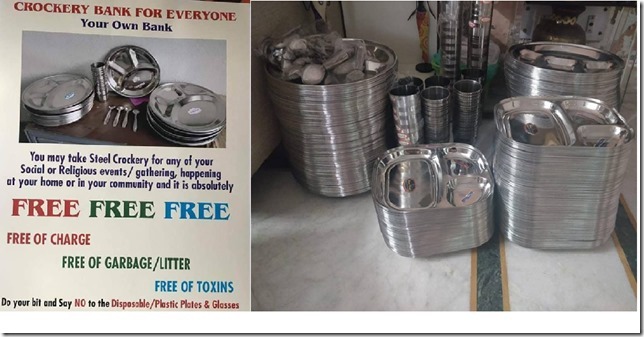 Meet Sameera Satija who, in a bid to reduce the use of disposable plates and glasses, has launched a ‘crockery bank’ that lends steel utensils to various programmes and events – all free of cost. How she started this one-of-the-kind initiative, Sameera shared that the large number of disposable plates, glasses that were left behind after any bhandara, langar, chabeel in public places always appalled her. Though people are doing good by serving food and drinks for free, but in the process, were generating a lot of waste which ends up harming the environment and health. Sameera knew that asking people to buy steel cutlery will not solve this problem since many people will not agree to do so. To overcome this barrier, she created a Facebook page called ‘Crockery Bank for Everyone’ with a simple formula “ask – use – wash – return”. 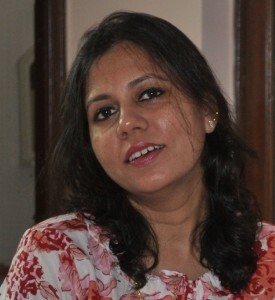 Apart from giving steel cutlery, Sameera is also spreading awareness on how to wash them in an eco-friendly manner, she suggests users to use potassium permanganate and soap nut powder; they are eco-friendly so the left out water can be utilised in watering the plants around, thereby ensuring zero harm is done to the soil, water or ground. Sameera’s ‘Çrockery Bank’ is operational in Gurugram and three places in Delhi right now. She hopes that people will get encouraged by this initiative and more such banks will start opening up at the community level. Sameera’s is doing her bit to curb the menace of plastic pollution and her initiative is truly awe-inspiring and applause-worthy. This post is part of the We Are the World Blogfest, a monthly event created by Damyanti Biswas and Belinda Witzenhausen to showcase stories of hope and light. This month I’m helping out as a co-host, along with extraordinary bloggers Eric Lahti, Inderpreet Uppal, Sylvia Stein and Peter Nena —please hop over to check out their WATWB posts as well as from other WATWB participants for a dose of feel-good to last you a whole month. You’ll be happy you did! Kudos to Sameera! I hope she receives a lot of support and this program catches on in all Indian cities. It is terrifying, the amount of plastic India consumes on a daily basis. If everyone in our country follows the footsteps of Sameera, then we can proudly say “We are an anti=plastic nation” in almost 5 years from now. Kudos to her kind yet innovative idea! 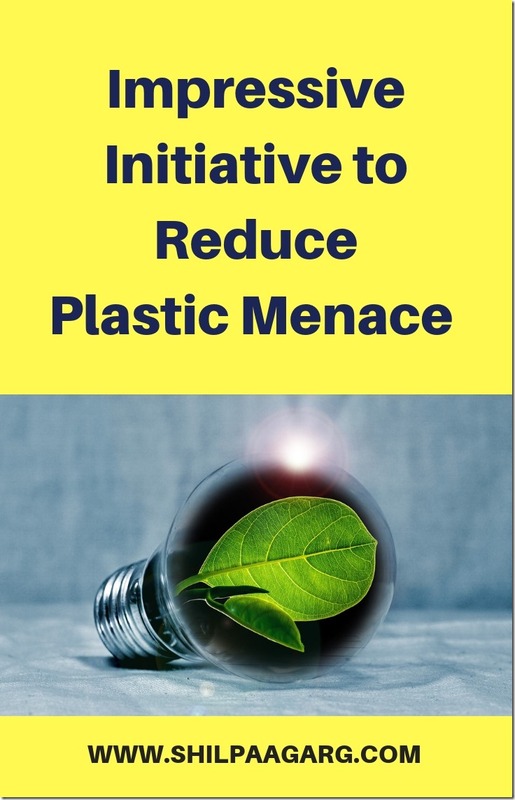 wow that ‘s such a nice innovative idea to reduce plastic Menace, I appreciate Sameera for her thought process and generosity in doing her part., thanks for sharing shilpa…. What a splendid initiative! It should be used all over. I hate to see all the disposable stuff left behind. She does it for free? Wow, kudos to her! I hate using plastic and the waste that occurs during wedding and other functions. It is definitely a hazard to our planet. I’m trying to eliminate plastic bit by bit from my life and home. What a GREAT initiative Shilpa thanks for sharing this inspiring story. Involving the community in this way and their being aware of the good they are doing can only foster good relations with the earth and the need for it to be taken care of. And she takes it further in stating the ingredients for washing utensils and crockery which are non harmful to the planet and whose water can be used eg for watering plants … Kudos to the beautiful Sameera! and the communities who take this on! ps thanks for co-hosting and have a great weekend! Such a practical way of making a difference. Thanks for sharing this, Shilpa. This is such a nice way Sameera! Hope we can all step on her feet! Bravo! Wow, what an enterprising and inspiring idea! It is so simple yet effective. Thanks for sharing this wonderful enterprise Shilpa. Hats off to Sameera! 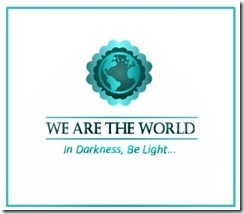 We wonder how we can contribute to the world. Her story is a lesson for all of us to look around and do our bit to make this world a better place. Bravo! Thanks for the share. Sameera is a rock star. More of us need to do what she is doing. I think our lifestyle needs to come a full circle. Earlier during the days when large extended families shared resources, there would be one repository for utensils to be used for larger gatherings and important occasions. This utensil bank feels like going back to those basics. Nevertheless a very good initiative. This is a fantastic initiative! Plastics are proving to be a huge problem to the environment that will take years to reverse… if that is possible. Hopefully, more countries adopt this initiative. Thanks so much for sharing and for being a part of #WATWB. Crockery Bank is sch a lovely initiative. Our environment needs more of such well-meaning citizens of Planet Earth. A very inspirational initiative by Sameera. Little drops make an ocean, and more Sameeras will make this earth a better place to live in. This is an awesome initiative and am hopeful of reduced garbage via the bhandaras. Its an awful sight to see the roads littered with plastic/styrofoam glasses, etc – its a common sight to see in Delhi-Gurgaon and I hope people do get onto this initiative and do their bit more responsibily!! What a wonderful initiative. This just goes to show that doing your bit isn’t as difficult as we make it out to be. Simple measures ca go a long way in easing out the plastic menace. I love your blog , you absolutely become my friend as i love nature & you are the lover of nature. Very interesting! I also learned something about washing dishes in a sustainable manner. Amazing initiative. I think the ladies should seriously think about it and spread the venture, no matter even on a smaller scale.